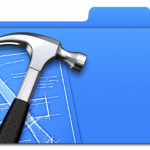 If you haven’t done so… go grab the latest release of Xcode. But beware… as soon as you download it, it’ll overwrite your current 4.3 installation. It comes without sdk’s 5.0 and below. So… as usually… i recommend you do that after your looong working journey. Otherwise you might find yourself stuck watching the download progress bar. No… that didn’t happen to me… i swear!. Bad thing is that Apple didn’t fix the Refactor functionality, yet. It’s getting kinda difficult to rename class names. For some reason, i keep getting an annoying popup saying that it cannot be done. There are several posts in stackoverflow saying that Dropbox might cause that… but my projects are not inside a Dropbox folder, so that option can be discarded. If i *ever* figure out how to make it work ok, i promess… i’ll post the solution, right here!